There is a long list of Red Dot sights on the market, however the problem is finding one that you would bet your life on when mounted to a defensive rifle. When it comes to defense worthy optics, we find ourselves faced with prices as high as the firearm itself. In the case of Vortex Sparc Red Dot sight, the SPARC (Speed Point Aiming for Rapid Combat) is military/defensive quality that you would bet your life on priced around $200 on the street. Vortex Optics was founded in 1986 and is unique as it is one of the few family owned and operated US companies left in the optics industry. Vortex is not a huge mega conglomerate who makes optics for other brands and companies; they have an efficient staff of over fifty dedicated and hard-working people running the business of just Vortex branded optics. Are Vortex optics made in the US? No, however unlike many other manufacturers who are just re-branding optics spec’ed and made by someone else, they are designing all their optics in house with inspection and service right here in central Wisconsin USA. When we think of Red Dot sights, there are actually several major design variations; all of which have various advantages. Open reflex sights are light, tube style red dots are notably more durable, and typically mini/micro red dots offer a compromise of size, weight and durability. 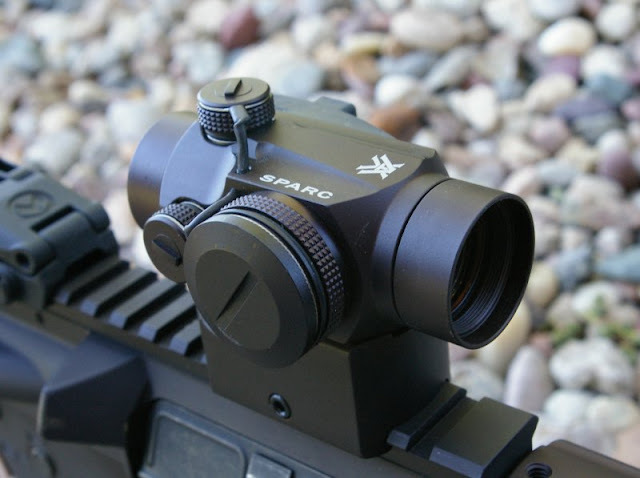 Though the Vortex SPARC is technically considered a mini/micro red dot sight, it is really a crossover size between a micro/mini and full sized tubed red dot sights. 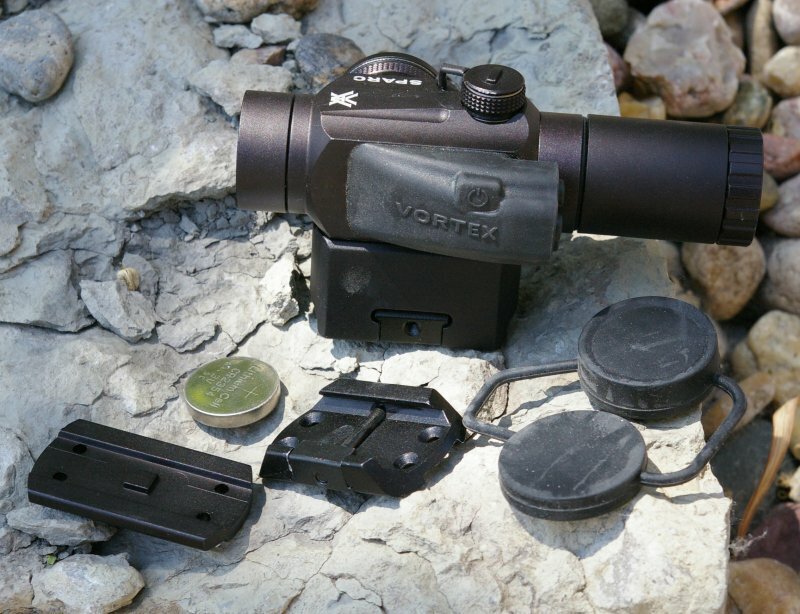 Vortex’s focus for the SPARC was to offer all the durability of a full sized tube red dot in a compact and lightweight package durable enough for large caliber Military and Law enforcement use but provide enough mounting versatility to be used on your .22 pistol or rifle. One of the things you will notice first is the absolutely superb quality, hard anodized 6061-T6 aluminum finish, and design of the Vortec SPARC red dot sight. At 5.2oz the Vortex Sparc Red Dot sight will not weigh you down like a full sized Red Dot, Trijicon, or Eotech which typically hover around the 1lb mark, however it is not a featherweight red dot either. If you are sensitive about weight you may want to look at Vortex’s new Razor reflex sight line which weigh in at an amazing 1.4oz. The construction weight adds durability in this case, and offers a good compromise between size, durability, and features. The Vortex SPARC red dot sight is a one piece construction which both simplifies construction and increases overall strength. The SPARC is still significantly smaller than any full sized red dot sight and appears to be quite a bit thicker in key areas than what you would see on mini/micro dot sights. No other manufacturer delivers this many accessories and mounting options right in the box. Four mounting height options are included in the box along with an two batteries, 2X multiplier, and a rubber bikini style lens cover. The huge benefit I seen with the Vortex SPARC is that you can lay down your $200 and go mount the thing versus having to start searching for the right height riser. Down the road, all that mounting flexibility will also allow you to move it to a completely different platform all without heading back to the store. I understand when manufacturers do not include scope rings, however it irks me that a variety of mounts are not included in the box on red dot sights which can be problematic from a mounting perspective. Thank you Vortex! 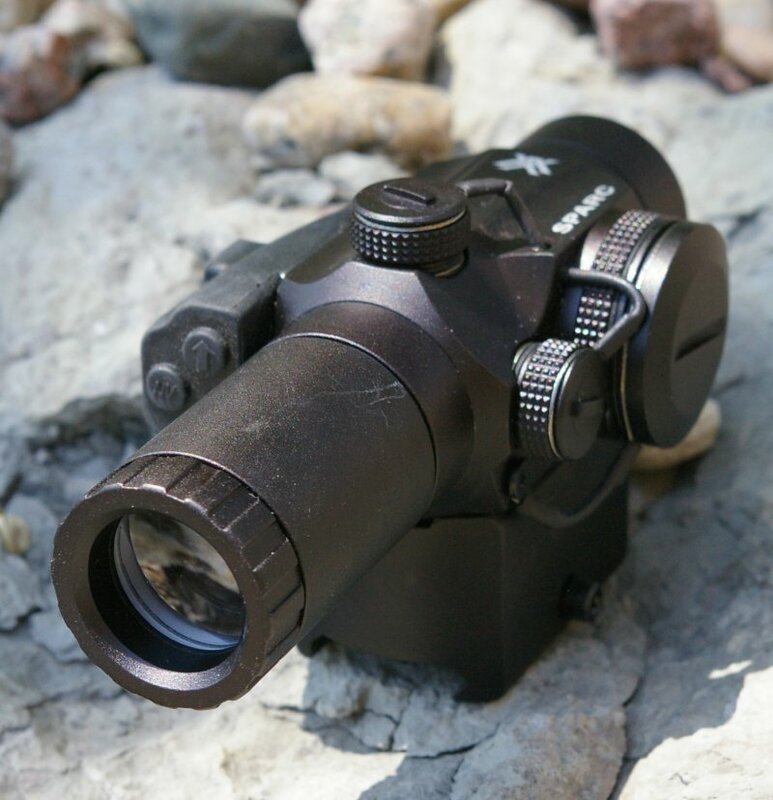 The The Vortex SPARC red dot sight uses the thicker, wider and longer running CR2354 3V battery which is in essence an upsized CR2032. According to Vortex, this battery is longer lasting and provides significantly longer run times than the standard CR2032 3V batteries. From a design perspective, Vortex obviously started with a clean sheet of paper versus just sticking to the fairly inconvenient twisty knob adjustment design as seen on most red dot sights. The most immediately noticeable feature is the electronic push button dot intensity control panel. 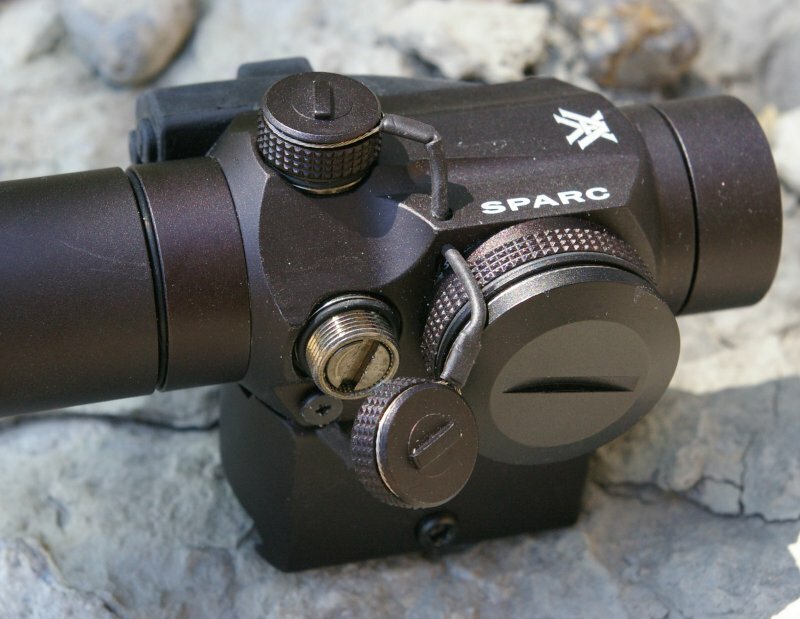 The Vortex SPARC red dot comes to life instantly with the push of the on/off button on the side of the panel and requires a full four second count while holding the same button down to turn it back off. The dot intensity can be adjusted up or down with the buttons and can be dropped instantly to an extra low night vision compatible mode with a touch of the “NV” button. Another touch of the NV button pops the red dot back up to the previous intensity level. Whether you are switching the Vortex SPARC red dot on or off or transitioning from night vision mode and back, the sight always goes back to the last dot intensity setting it was one. One of my frustrations on some sights is that dot intensity always starts at a preset level which always requires you to click it up or down to your liking. The SPARC will retain your last setting unless you change it or pull the battery. For a home defense carbine, which is most likely to be used at night, you can preset a comfortable dot setting so whenever you turn on the Vortex SPARC it is ready to go instantly without being blinded the dark house by a searing red dot... one less thing to thing about. The SPARC also has an auto-off feature after 6 hours which greatly extends battery life which ranges from 120 on max brightness to 3400 on lowest setting and even longer in NV mode. Based on my experience expect around three months (1700 hours) of continuous run time, however for most users you probably will not replace the battery more than once every third year. The optics are fully multi-coated for increased light transmission, waterproof, nitrogen purged fogproof, shockproof to withstand 1000 rounds of .375 H&H Magnum shots, parallax free beyond 50 yards for both eyes open shooting. If you are using the sight for .22LR shooting just note that you need to assure you center the dot otherwise you can be off by up to an inch if shots are taken with the dot when the dot is at the outer visible rim. A little detail which shows Vortex took time to think about the design are the wire lanyard attached adjustment and battery compartment covers. Ever taken off your turret cover and spent 20 minutes figuring out where it went to after you finished zero’ing your rifle, I have and this prevents lose. Love the little details Vortex has thought through. The screw in 2X multiplier is handy and an upgrade almost every single manufacturer charges additionally for. With the 2X multiplier attached the field of vision does drastically decrease on the Vortex SPARC red dot, however I found it very useful for taking longer distance shots with the AR. During testing on my tricked out Kidd 10/22 competition rifle. 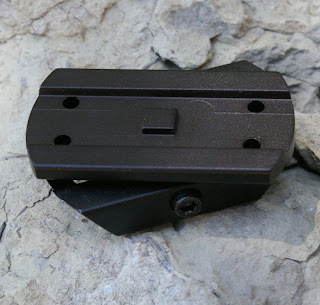 The multiplier is not as convenient as a quick detach or hinged flip over magnifier, however it is something really handy to stick in your pack or pocket when longer distance targets are engaged. 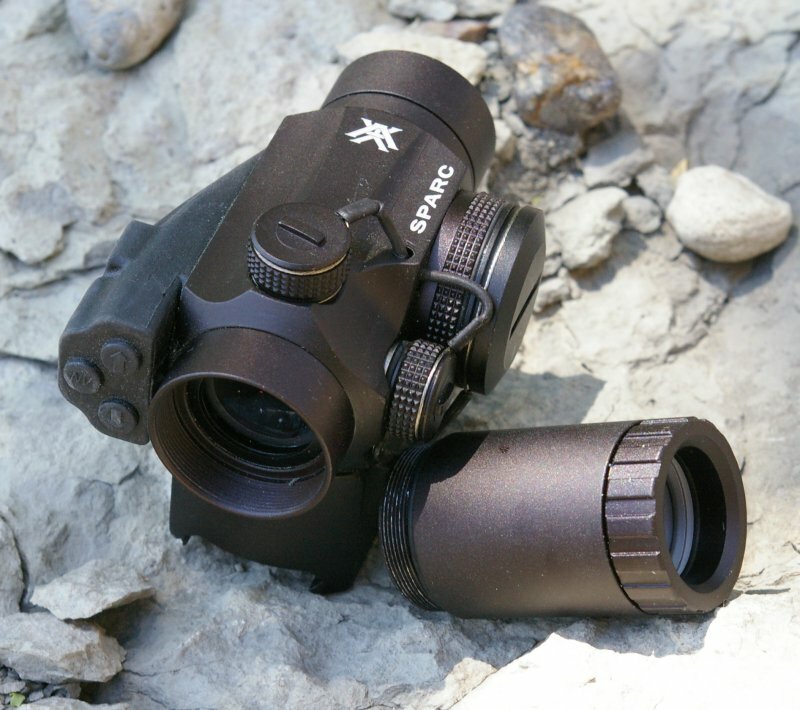 Functionally the Vortex SPARC red dot sight can be used on anything from AR15s, to shotguns, and pistols and provides a 2 MOA red dot visable in the brightest sun and darkest night. I tested the SPARC on my a couple of my ARs including the shown Spikes Tactical ST-15, a I would note works outstanding as a critter getter sight on your .22 with or without the 2X magnifier installed. 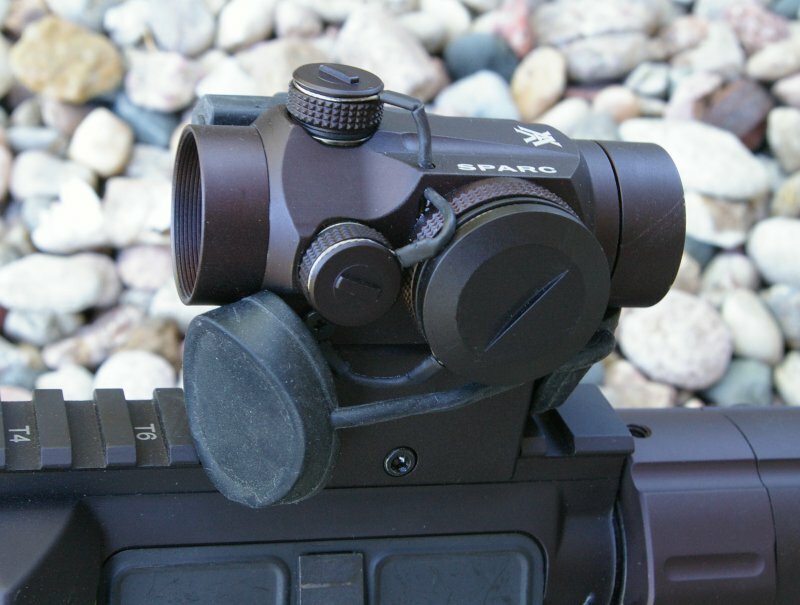 The mounts included with the Vortex SPARC red dot sight provide four heights of 1913 picatiny rail mounts. 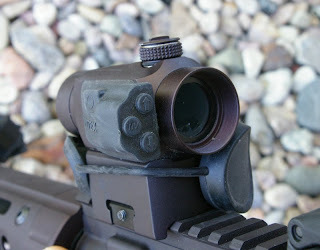 A tall or short picatinny rail can be screwed to the base of the sight and a shim can be stacked on either rail to provide a total of four mounting heights. 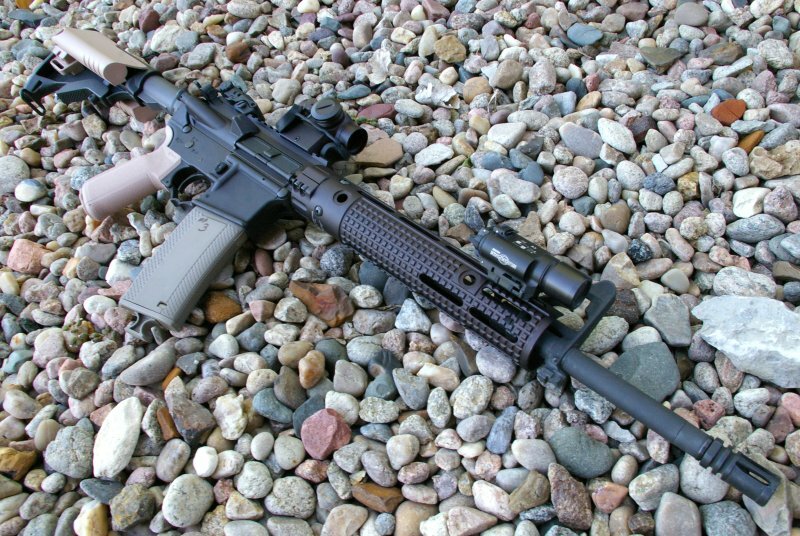 On hunting rifles and pistols the short rail will work perfectly, however on an AR some prefer a perfect co-witness with iron sights and some prefer the iron sights to be visible in the lower third. The short and tall rails and shim can be used to deliver the perfect height; 18.5mm (.725 inches), 22mm (.875 inches), 36mm (1.425 inches), 40mm (1.575 inches). This is an awesome sight and very competitively priced at around $200. If we look at everything that comes in the box, it is without a doubt the best red dot deal on the market. A decent riser starts around $25 and 2X multipliers can easily tip over the $200 mark and let’s not forget those expensive little $5 batteries which they also provide one to use and one as a spare. Operating Temperature -40 degrees to +140 degrees Fahrenheit. have you made a youtube video review on this ?